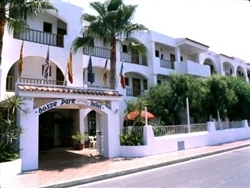 Bossa Park Hotel Ibiza Island Eivissa, Hotel Spain. Limited Time Offer! More of aRead more Family establishment, this three star hotel is located in Ibiza. Several amenities, notably Restaurant, Tennis Court are available at the hotel.You can reach Ibiza in 14 minutes by car (the airport is 4 miles from the hotel).This hotel offers a unique service : currency exchange.Relax yourself in the hotel's gym.